Today for Halloween Reads, I’ve got a vampire book! I don’t normally read vampire books, but this one was great. Although this looks like a low rating, it’s actually a good one! By Holly Black, published by Indigo. 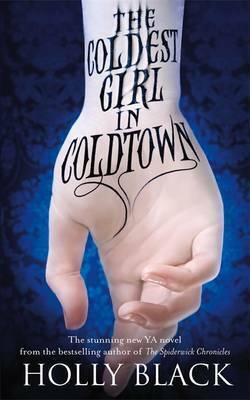 Goodreads Synopsis: Tana lives in a world where walled cities called Coldtowns exist. In them, quarantined monsters and humans mingle in a decadently bloody mix of predator and prey. The only problem is, once you pass through Coldtown’s gates, you can never leave. My Review: I don’t think I’ve read many vampire books before. Twilight, Darren Shan’s Cirque Du Freak… that’s about it, I think! I’m not the biggest fan of them; probably because Twilight caused the YA industry to overflow with them, and I just avoided them, really. However, I requested a copy of Coldtown because the synopsis really captured me. It seemed very different to any other Vampire book I’ve heard about! Coldtown really is a unique book. The concept is nothing like I’ve ever heard of, not just in the gothic genre: Quarantined towns of blood-suckers, rumored to be eternal parties for the undead; broadcast 24/7 on TV. Well… at first, I thought HUNGER GAMES!! !, but then, I was really wrong! The plot and all aspects of this novel were really original. I found some parts not explained as well as others- for instance, I couldn’t get to grips with the background of Gabriel, our lead vampire. I’m not sure if that was just me, or if it just wasn’t revealed in enough depth, though. However, it was a really thought-provoking concept: Because it was very realistic, and slightly political. The reason it’s a scary book is because the events are way too possible, if vampires exist! The writing was, quite simply, very beautiful. From the start, I was hooked onto this novel, because the writing was so fluent, so descriptive… I just admire Holly’s writing so much! The book was written in a very interesting way. Flashback chapters, of course, have been done before by many authors; but in this book, pretty much every other chapter is a flashback for a certain character. That gave a really great insight into the character’s backgrounds, without lengthy, boring explanations during scenes set in the time of Tara’s adventure. The flashbacks were sometimes emotional, sometimes terrifying- and let me get to know Tara, primarily, very well. While they were so great to read, they did occasionally slow down the novel at points. Holly would leave a chapter on a cliffhanger, write a chapter focusing on another character or on something in the past, then go and tie ends together. It’s a great narrative hook, but at points it did frustrate me a little! Tana was a brilliant main character. I was rooting for her to get through everything okay right form the start, when she wakes up in a bathroom after a high school party, and finds her friends massacred by vampires. She was a very self dependent, down-to-Earth and understandable- so she was very realistic. If you strip away all of the vampire trauma from her life, she is a very relatable character that I think teens will love! Her journey in this book involved life decisions, a fair bit of violence, friendships, and a pinch of romance… there wasn’t a moment I was bored of her! Overall, Coldtown was a really good book, and it’s probably urged me to read some more books in the vampire genre. I enjoyed reading about the main character, and the idea for the story was scarily realistic, thought provoking, and interesting. It was a really fun read, great for Halloween- but a couple of things did let it down. The writing style, despite being quite clever, slowed down the pace at points. Also, I didn’t find some aspects explained as well as I’d have wanted it to be (Hopefully if I re-read it soon I’ll understand things better!) and so that made it slightly less awesome. But, it was an awesome book. Highly recommended to fans of gothic fiction! This seems like a low rating, but it really isn’t! I received a copy of Coldtown from the publisher, in exchange for a review. In no way at all did this affect my thoughts. This entry was posted in Uncategorized and tagged dystopia, gothic, urban fantasy on October 28, 2013 by keithbwalters. I’m not the biggest fan of vampire fiction either, but I’m really intrigued to read this one.